Sometimes the way we perceive ourselves is totally different than the way the world sees us. 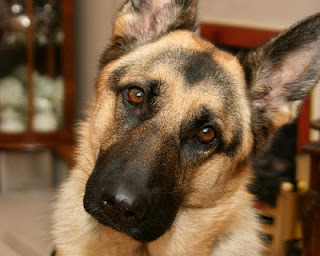 The best dog I ever had was a German Shepherd named Ninoy. He was a beautiful dog with about 50 lbs. of pure muscle. His looks were fierce and his bark even fiercer, but he thought he was a lap dog. I would be sitting in a comfy chair reading a book and Ninoy would come bounding over to jump on my lap, nearly toppling me and the chair in the process. It would take a bit of effort for us both to get settled comfortably but once we did we were both very happy. Once a family with a baby visited us and left their empty infant seat on the floor in the living room. We came back into the room later to find Ninoy curled up in the infant seat as best as he could manage. Ninoy was a stray. Dad came home with him one day. Mom took one look at that fierce dog and declared that that dog was not staying. "Either he goes or I go" she stated. Some animals (and people) seem to have more than their fair share of personality and Ninoy was one of those dogs. People will judge you by your appearance but you do not have to conform to their expectations.